As homeowners living in the urban/wildland interface we are responsible for protecting our wildlife – not poisoning them. Their agonizing deaths due to rodent poisons are the unintended consequences of homeowners using poisons to eradicate pests like rats, mice, squirrels and gophers. Bobcats, mountain lions, coyotes, owls, hawks and other raptors then eat these poisoned rodents and die a slow painful death too. Here is what rodent poisons do to our wildlife. 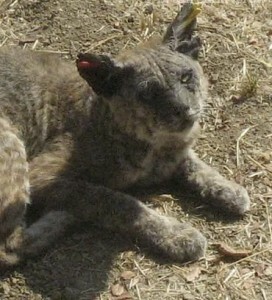 This is the same bobcat one year apart – healthy and vibrant and then dying of mange. Please don’t do this to our wildlife. Some rodenticides even have a “secondary poison” effect – first for animals that ingest them; and second for wildlife and domestic pets that eat them. Don’t use potent poisons – anticoagulants – that are sometimes hidden in bait boxes. Once ingested they can take up to two weeks before causing death by internal bleeding. Other poisons attack central nervous systems causing seizures before death, or kidney and heart failure, or severe muscular convulsions ultimately causing death. There are many non-poison alternatives available to eradicating pests including natural predators, old-fashioned mouse traps, cage and electronic rat-zappers. Ask your Pest-X person – they also know the “safe” alternatives. Stay tuned for our upcoming flyer with information to help homeowners banish rodent pests but Save Our Wildlife! DID YOU KNOW – A family of barn owls can consume up to 3000 rodents in one breeding season?